On May 9, 2016, Dr. James Fetzer, retired professor of philosophy of science (until 2006 at the University of Minnesota, Duluth), hosted Germar Rudolf during Episode 198 of his internet broadcast series The Real Deal. Rudolf presented a two-hour slideshow giving an overview of the recently released study CURATED LIES: The Auschwitz Museum’s Misrepresentations & Deceptions by Italian Holocaust Historian Carlo Mattogno. This is the original narrated PowerPoint presentation in high quality, not Fetzer’s low-resolution version. Because these facts contradict a great body of the history of World War II, Polish researchers at the Auschwitz Museum have been under enormous pressure to respond to this revisionist challenge. In 2014, the museum researchers issued a book, The Beginnings of the Extermination of Jews in KL Auschwitz in the Light of the Source Materials, reprinting 74 original German wartime documents which they claim prove the construction and use of homicidal gas chambers at Auschwitz by the German government and the German civilian and military forces who ran the camp. However, upon examination of the book, none of the “new” evidence or analysis holds water. In its main section, Curated Lies is, therefore, a point by point refutation of the Auschwitz Museum’s book. This main section is preceded by a section focusing on the Auschwitz Museum’s most coveted asset: the alleged gas chamber inside the Old Crematorium, toured every year by well over a million visitors. 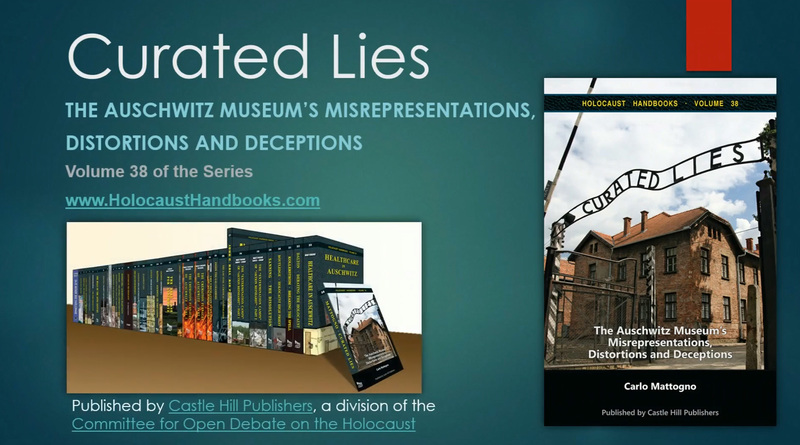 We begin Curated Lies therefore by exposing the many ways in which visitors have been deceived and misled by forgeries and misrepresentations committed by the Auschwitz Museum, some of which are maintained to this day. Next Next post: Just look at a “Present Day” tour of Auschwitz!